Revenues: Total dollar amount brought in from sales. Called the top line because it’s the top line of the income statement, revenues record the company’s total (gross) sales of products and services. Costs of products sold: Also called cost of revenue and cost of goods sold, this figure represents the costs of buying raw materials and producing the finished products. Gross profit: Deduct the cost of products sold from the total revenues to arrive at gross profit. The first benchmark comes right here, the gross margin or profit margin, also known as the return on sales. Divide gross profit by revenues to get profit margin. Selling costs include all expenditures to sell the product, such as marketing and travel. Administrative includes salaries and other services such as accountants and lawyers. General costs encompass the costs to maintain plants and equipment. Operating income: The difference between gross profit and selling, general, and administrative expenses. 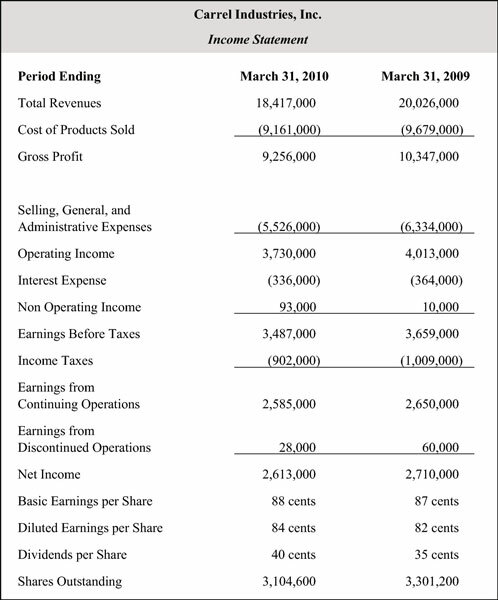 Operating income represents the total amount of profits that came from the actual performance of the company’s business. Earnings before interest, taxes, depreciation and amortization: These earnings, often referred to as EBITDA, combine operating income with income from investments. EBITDA is useful in giving a view to profits before non-cash accounting calculations, such as depreciation and amortization, are deducted. However, EBITDA is not an official number under the Generally Accepted Accounting Principles (GAAP), so it can be manipulated to suit management’s goals. Interest expense: The interest paid on debt. Non operating income: Any income that doesn’t come from the company’s operations, such as the sale of assets or investment income. Earnings from continuing operations: Profits from the company’s current businesses. Earnings from discontinued operations: Profits from any businesses the company closed or sold this quarter. Net Income: The true profit after every other possible expense has been paid. The profit is the bottom line, because it’s the last line on the income statement and what really matters at the end of each quarter. In the end, does this company make a profit or loss, and how big is it? Any time you see a number in parentheses, it means that’s a negative number, or outflow of money. If the net income figure is in parenthesis, the company recorded a net loss for the quarter.